One question I’m frequently asked: what do you read to keep up with developments in biopharma? My recommendations are below, but keep in mind that my needs may be different from yours. It depends on an individuals background, their interests, how they plan to use that information, and how much they want to spend. Most people will give disparate answers to this question, and that’s just how it should be. Personally, I like to focus on drug development innovations in cancer, scientific progress, novel business models, healthcare issues, and basic biological science stories. What I don’t generally care to read about are biotech company venture rounds, possible IPOs, executive job changes, and company press releases disguised as news (although investors love this stuff). I also like to read about a pretty wide spectrum of specific topics, such as drug pricing, pharma screw-ups (great to learn from others mistakes), irreproducibility issues, problems resulting from clinical over-diagnosis, the mechanisms behind drug actions, and science history narratives. Many of these stories have been the impetus for one of my blog pieces; they often lead me to dive into those topics in much greater depth. As a result, I maintain an organized-by-topic (and rather lengthy) list of book recommendations on my website to keep track of them all. The news sources I’ve listed below represent a pretty wide spectrum of journalistic business models. This is not surprising given the changing nature of the industry, most of which has been driven by the rise of the Internet. Making money in this area was probably never easy, but these days, with the loss of print advertising dollars, it’s become much harder. Let me editorialize for a moment before you dig into my list below. When President Trump proclaimed, “nobody knew that healthcare could be so complicated,” most of the people I interact with knew just the opposite. It’s incredibly complicated, which is one of the primary reasons it’s so difficult to fix problems in that area. The biological sciences, which form the core of many healthcare issues, are especially complex. Journal articles are technically complicated and not that easy to understand (or explain to lay people). My view is that trying to clearly describe issues in science, drug development, and healthcare in just a few hundred words generally doesn’t work too well. There’s just not enough information. Important details get glossed over or omitted, leaving readers muddled or thinking that they understand something that they really don’t. It’s for this reason that I like to read (and write) articles that go into considerable depth. Reading this material won’t turn you into an instant expert. However, it should convey the basic facts, define what the unknowns are, explain the impediments that stand in the way of making progress, and put it all in context. STAT and STAT Plus News (both FREE and PAYWALL components) – This is less than two years old, but is probably my favorite source of news on science, medicine, and biotech. John Henry, who owns Boston Globe Media as well as the Boston Red Sox, put a ton of money into launching this project. It’s reflected in the product that they put out. Based out of Boston, the number one biotech/pharma location in the United States. Excellent bullpen of science writers. Ed Silverman (formerly of the Wall Street Journal) writes their daily Pharmalot column focused on the pharmaceutical industry. Stat News recently scored a coup by adding Adam Feuerstein (formerly the “calls it as he sees it” writer for TheStreet.com) to the staff. There are a number of separate newsletters (I get Morning Rounds and The Readout, which are free), along with Stat Plus, which contain additional articles that are available on a paid subscription basis. Well organized website. Signal podcast done in conjunction with Luke Timmerman (see below). One other feature I like: they point you daily to other interesting articles published elsewhere. Endpoints News (Mostly FREE, but with some additional benefits for those who sign up for a premium tier coverage) – Started last year by Arsalan Arif, the former publisher of FierceMarkets life science publications, this site is primarily written by Editor-in-Chief John Carroll. Articles are generally much longer (and therefore more in-depth) than some other publications, which provides a more well-rounded view of the story. Focus is on corporate news, deal making, and FDA actions (including rejections and approvals of new drug applications). Slowly adding staff as it grows. 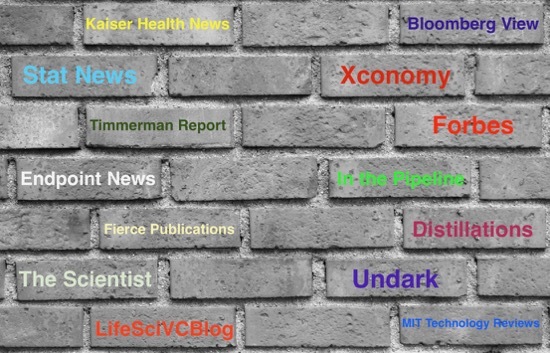 Xconomy (FREE) – This media outlet covers news on the intersection of business economics with emerging technologies in a wide number of fields (biotech, AI, tech, hardware, and software). Their Exome column focuses on biotechnology and healthcare issues, and is led by National Biotech reporter Alex Lash, who is based in SF. Associate Biotech editor Ben Fidler is based in NY, and a half-dozen other reporters cover the rest of the country. [Full disclosure – I was an unpaid contributor to Xconomy for 6 years]. Quality writing, and the territorial focus afforded by having different offices around the country is something that most of the other options don’t offer. This is important at a time when most local newspapers (outside of a few cities, like Boston and San Francisco) provide no coverage of the local biotech scene. Timmerman Report (PAYWALL) – The report is written by former Seattle Times biotech reporter Luke Timmerman, who also had stints at Xconomy and Bloomberg. The site is open to subscribers only, although free articles are occasionally posted. Stories are posted two to three times per week. Well written and researched, with a focus on companies, business, people, and science. Occasional guest blogs by other writers. You can also find instructions on the website for signing up for Luke’s podcast The Long Run, which features interviews with biotech newsmakers. Fierce Publications (FREE) – Fierce puts out a series of eight newsletters tailored to different groups, although there is often significant overlap e.g. Fierce Pharma and Fierce Biotech often have the same stories. Covers some topics that are not as widely reported on by others, such as medtech, drug manufacturing, marketing, and contract research organizations. Some come out daily (like the two I just mentioned) while others (Fierce BiotechResearch and Fierce LifeSciences) come out just once or twice a week. The primary focus on companies, funding, clinical trial results and blowups. It provides less actual science content than many of the other sites, and the articles are quite brief. Appropriate if you’re really just looking for summary content. The Scientist (FREE online) – If you’re looking primarily for science content, this is the first newsletter to look at. Covers industry news from time to time, but the primary content is focused on basic and applied biological sciences. Mix of short articles with more in-depth review pieces, and also carries opinion pieces. Published daily. This newsletter is tied in to the magazine of the same name for scientists. Quality writing, and a much deeper dive into actual science. Forbes (FREE online, but the print magazine is a paid subscription) – Forbes is a business magazine that’s been around 100 years. Not surprisingly for a business publication, the primary focus is on the financial aspects of the companies discussed, which are often built around profiles of company founders and other top executives. Only a small fraction of the content is focused on biopharma, but that usually translates as one or two stories per issue. Mathew Herper is the primary biopharma writer here, and his content is usually quite solid. Contributions from other writers (most of whom are not on staff) are of variable quality. Website can be quite difficult to navigate depending on your browser. Most difficult to read online of all of these websites (the dreaded split pages, with slow loading times and no option for reading all on a single page). MIT Technology Review (PAYWALL) – Covers a wide range of technologies, not just biotech. Well-written stories feature the science but cover important business aspects as well. Subscriptions are for both print and online products, all of which are behind a paywall. Individual articles are can (usually) be accessed online for free. Undark (FREE) – A weekly online magazine that features in-depth articles (Case Studies) across a wide range of science topics (there’s much more here than biology or biopharma). As they put it, their articles explore “the intersection of science and society.” Photos accompanying the articles are first rate, making this feel like the National Geographic of online science magazines. Also has opinion pieces, book reviews, and a podcast series (which is also available as a transcription). In the Pipeline (FREE) – This is the (almost) daily blog written by medicinal chemist Derek Lowe. This used to be his freestanding blog, but it now comes out under the banner of Science Translational Medicine (a publication of the American Association for the Advancement of Science). It has a strong focus on science, both medicinal chemistry and biology, with forays into various notable events in biopharma. These include hiring practices in the land of biopharma, drug approvals and rejections, and drug pricing and costs. Very timely commentary of current events. One of the few blogs that allows for the posting of user comments, and attracts quite a lot of them (which are often as interesting as the blog itself). Well written and insightful. Bruce Booth’s LifeSciVC Blog (FREE) – Bruce is a recovering scientist turned early stage venture capitalist (his words, not mine). He writes a blog (from his position as Partner at Atlas Ventures) of often lengthy, in-depth pieces on varying aspects of biopharma, with a strong emphasis on the building of new companies. He has the science chops (Ph.D. in molecular immunology) to delve into why he thinks the science is important, how it works, and how the financials relate to this. Good at explaining his thinking, and he often includes charts and tables to back up his arguments. Where others sometimes dance around the science, he dives right in. Occasional guest posts by folks connected to his VC firm as well. Bloomberg View (FREE) – Articles written by a small group of Bloomberg writers (within the larger Bloomberg organization) are usually well-crafted and cover a wide spectrum of healthcare issues. I appreciate the depth that they go into on many of the stories. Takes a bit of effort to search these out, but good content. If you have other news sources where you find good information on all things biopharma, please pass them along to me (along with a brief note saying why you like them), and I will update this article to reflect the new information. Distillations (FREE) – This is a magazine (both online and print) published by the Chemical Heritage Foundation. At its core are articles about various aspects of science and technology (especially chemistry) and how these affect our lives. However, it is not limited to that discipline and features articles about other scientific disciplines and technology. The CHF collects, preserves, and exhibits historical artifacts at its headquarters in Philadelphia, which includes a free museum. As a result, many of the articles here have a historical bent. The magazine features both a blog and a podcast. I’ll make a few more suggestions. Those of you who are relatively new to the biopharma area should check out some of the books in the first two sections of the Book Recommendations page on my Website. There are many outstanding examples there. I’m also a big fan of long-form exposés that really dig into a topic in depth. Good ones published in the past few years include Steven Brill’s articles Why Medical Bills are Killing Us as well as America’s Most Admired Lawbreaker (about Johnson and Johnson’s drug Risperdal). Also take a look at Reuters multi-part series The Body Brokers, by Brian Grow and John Shiffman, and Anne Kim’s look at big profits being made on the backs of the poor in The Dialysis Machine.